Contributed by Declan McGuire, Hiding in plain sight, the rhetoric of passive hostility is another in our series of occasional features. This article originally appeared in the November 2013 issue of Bike Buyers Guide, through which MAG Ireland has been afforded the opportunity to explore some of the challenges facing riders today. There’s a conversation which, at some point in time, anyone who has ever ridden a powered two wheeler will have had. The situation will vary, but the narrative will be wearily familiar. You’ll find yourself engaged in conversation with someone you know only casually, perhaps a friend of a friend, or a new colleague in work and inevitably they’ll learn for the first time that you ride a motorcycle. Chances are that within seconds you’ll hear the phrase “motorbikes are dangerous” or some variation thereof which immediately defines you as having questionable judgement while your new found confidant goes on to tell you why they’d never be so reckless with their own safety as you clearly are with yours. At this point in the conversation you’ll be on the defensive as the burden of proof has been put upon you and anything further you say is automatically taken as an attempt to defuse the “motorbikes are dangerous” statement. The phrase “motorbikes are dangerous” is a loaded one because it presumes that in choosing a so-called “dangerous” mode of transport, riders themselves have less concern for their own safety than do motorists. This is doubly insidious given that it predisposes motorists to the view that those of us who ride motorcycles are somehow inherently less deserving of due consideration on the roads. Simply put, the presumption is that if you don’t care for your own safety because you ride a motorbike, why should anyone else? Now, on the face of it, dangerous is a valid claim. For every thousand miles you travel, you are more likely to be injured, or worse, while riding your bike than while driving your car. What this actually means is that we as riders are more vulnerable while riding than while driving. Quite simply, motorcycle riders are vulnerable road users. According to the RSA’s 2011 Road Collision Fact Book (the latest year for which details have been published), “The 18 motorcyclist fatalities that occurred in 2011 accounted for 10 per cent of all fatalities.” Although the figure varies in official publications, it is widely accepted that motorcyclists make up about 2% of road traffic, and yet in 2011 were 10% of fatalities. 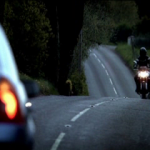 It is indeed an appalling and tragic situation that a disproportionately high number of riders are killed and injured on Irish roads every year, and it is a trend that we in MAG Ireland have worked to reduce through education and awareness. In fact, MAG Ireland co-authored the RSA’s “This is your Bike” booklet and as I write is currently engaged in the drafting of the new updated version due out in 2014. Our efforts continue to be hampered however, by the entrenched attitude that motorcycles (and by association, their riders) are dangerous and must therefore be discouraged, controlled or prevented in some way. We in MAG Ireland describe this phenomenon as “passive hostility”. 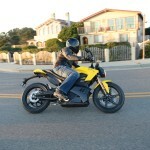 It is born of a mind-set in which motorcycles are seen as a “problem” and not a “solution“. This mind-set is best illustrated in comparing the approach taken to another vulnerable road user group, namely cyclists. 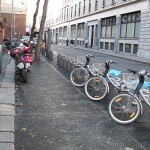 As vulnerable road users, cyclists are, quite rightly, afforded the protection of a defined national cycling strategy backed up with millions of Euro to fund promotion and safety initiatives, tax breaks for commuter cycling, legal requirements to consider the needs of cyclists at every stage of infrastructure and urban planning, a bike hire scheme, dedicated cycle infrastructure and parking facilities, and all the while cyclist representatives have a consultative role in all of this. We motorcyclists, by comparison, are typically ignored or not consulted at all, receive no official support whatsoever, are forced to pay punitive rates of VAT on compulsory safety equipment, are subject to stringent license and training requirements far in excess of those which apply to car drivers and are prohibited by law from taking advantage of facilities such as advanced stop boxes and bus gates which could reduce our vulnerability. Meanwhile bodies such as the National Transport Authority (NTA) refuse even to acknowledge the modal distinction between a motorcycle and a car, much less consider the needs of motorcyclists themselves as a distinct group of vulnerable road users alongside cyclists and pedestrians. In fact, the Irish transport authorities actively discourage motorcycling, for example by upholding the exclusion of motorcycles from bus lanes despite their own studies finding no evidence to justify this position and in direct contradiction of best practice elsewhere, not least just a few miles up the road in Belfast. Translation: “We’ll continue to completely ignore an entire group of vulnerable road users in the face of any evidence whatsoever which challenges our own perceptions, never mind what’s happening at the other end of the M1 motorway”. This is what we mean by passive hostility. It is an attitude born of the unthinking belief that “motorcycles are dangerous”, a splendidly simple sound bite that avoids having to acknowledge, much less address, the real issues around successful integration of motorcycles in the transport mix. It is precisely this dismissive attitude (and the failed transport policies it engenders) which alienates riders and thus makes it increasingly difficult for organisations like MAG Ireland to promote safe and responsible riding. It matters not whether you’re a born again biker, moped or scooter rider, rally goer, workday commuter or weekend warrior because ultimately the “motorbikes are dangerous” stereotype negatively affects all of us whether we realise it or not. Motorbikes may be dangerous. Riders, however, are vulnerable, and vulnerable is not the same thing as dangerous. That conversation will come around again, and the narrative will still be wearily familiar. So the next time you hear someone utter the phrase “motorbikes are dangerous” pause to reflect, and perhaps remind them that their splendidly simplistic statement may in fact be part of the problem. MAG Ireland has been afforded the opportunity to explore some of the challenges facing riders today through a column in Bike Buyers Guide. With a wide selection of news, views and reviews it’s Ireland leading motorcycle magazine. Out monthly for €4.99 in all good newsagents.